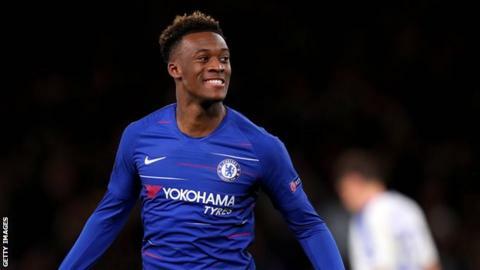 Chelsea winger Callum Hudson-Odoi - who is yet to start a Premier League game - says he is "shocked" to have received his first England call-up. The 18-year-old was brought into the England squad on Monday for the upcoming Euro 2020 qualifiers against the Czech Republic and Montenegro. He has played 19 games for Chelsea this season, scoring five times. "It's been a crazy experience but I'm delighted," Hudson-Odoi said. "I thought the manager was joking." He was with England's Under-21 squad, having received his first call-up at that level last week, when he was told he was being promoted to the senior squad by U21 manager Aidy Boothroyd. "I was shocked and then when I heard that I actually had to go over, I couldn't believe it," Hudson-Odoi added. "I was delighted. It's a dream come true. Now I've got to work hard, enjoy every moment and keep working to just hopefully make an impact when I get the opportunity." Hudson-Odoi was called up after full-back Luke Shaw joined John Stones, Fabian Delph and Ruben Loftus-Cheek in withdrawing from the squad. Earlier on Monday, Southampton midfielder James Ward-Prowse was added to the squad as a replacement. England host the Czechs at Wembley on Friday, 22 March and are away in Montenegro on Monday, 25 March. Hudson-Odoi has only made 23 first-team appearances in his career and would become England's eighth youngest player if he makes his debut against either the Czech Republic or Montenegro. Theo Walcott is England's youngest international. He was aged 17 years and 75 days when he made his debut against Hungary in 2006, having not played in the top flight. Eleven of Hudson-Odoi's 19 appearances for Chelsea this season have come as a substitute with his starts all coming in cup competitions. In his eight starts, though, he has scored four goals and has four assists. Former Chelsea midfielder Andy Townsend says it is a "shrewd move" by England manager Gareth Southgate to call up Hudson-Odoi. "Whenever I have seen Hudson-Odoi play I have thought he has got something about him and he suggests when you give him the ball he will make something happen," Townsend said. "It is also saying to the player if you want more you have got to get your head down and find a way to get regular football, whether that is at Chelsea or Bayern Munich." Unhappy with his playing time, Hudson-Odoi handed in a transfer request in January after he was the subject of a £35m bid from Bayern but Chelsea refused to sell. Earlier this month, Blues manager Maurizio Sarri said it was "dangerous" to put too much pressure on the teenager, adding he would only be a "top" player aged 22 or 23.